The feature that separates the Tidy Cats Breeze Litter System is their unique ability to separate urine and feces from the cat litter that comes with the kit. When you buy the Breeze litter box kit, 4 pads are included in the box, which should last an average of one month. 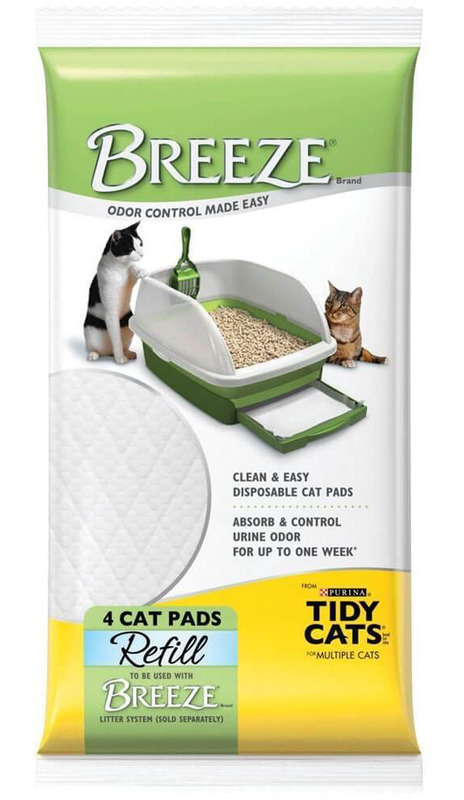 Once you’ve used up the pads included in the kit, you can buy the Breeze Tidy Cat Litter Pads separately from the company or from authorized online retailers. You can choose from packs of 4 to packs of 10, depending on your cat’s needs. Let’s take a look at the pads’ features and advantages, as well as a few of its cons. The pads are placed on a tray found on the bottom of the litter box that comes with the Breeze Litter System. You simply place one pad on the tray, which catches the urine that passes through the pellets. Polyethylene is used in many applications, which includes baby diapers. Polyethylene is a form of plastic and used on the back sheet of the pads, as they prevent urine from leaking out. One pad can last for one week for an average-sized cat. If you have two cats, they can share one litter box but you’ll probably need to change the pads every 3 to 4 days. If your cat pees frequently, expect to change the pads every few days. Another great thing about the Breeze litter pads is that they reduce the strong ammonia odor of cat urine. Cat pee is incredibly smelly and one of the reasons why owning a pet cat can be extremely frustrating. While these furry felines are cute, their waste smell are incredibly repulsive. The Breeze pads reduce the odor, with some users reporting to not smelling anything at all. For an average-sized cat, you probably won’t smell anything for a good week but once the pads are soaked up, you should expect it to smell a bit and this tells you to change the pads at once. Easy to Clean – All you have to do is to pull out the tray, take out the pad, roll it in plastic or newspaper, and throw it in the trash. If the pad is soaked, you can use disposable gloves to handle it. If you forget to take it out after one week or when it’s too soaked, some urine can get out and urine can stay in the tray. In this case, cleaning out the litter box would be essential. Long-Lasting – These pads act like diapers or pee pads but last longer. Diapers and pee pads must be changed on a daily basis or several times a day, but the Breeze pads’ volume capacity is much larger, which makes them an economical choice. Helps to Prevent Clumping – Because they absorb all the liquid that goes through the cat litter or pellets, they help to prevent litter clumping, which are dangerous for small kittens who might ingest clumps. Small Pads – A lot of customers think the pads or the litter box is too small. More Expensive Than Other Alternatives – The Breeze refill pads are indeed more expensive than other similar products in the market. The refill pads are recommended for pet cat owners who have the Breeze litter system. These pads should not be used on their own or with other litter boxes. If you have an average-sized feline pet, or if you have two medium-sized cats, the litter box and pads are perfect. The pads are necessary to maintain the litter system, and it’s recommended that you buy a few packs in advance. The Breeze refill pads are highly recommended for anyone who owns the Breeze litter system. Buying a few packs in advance will save you from the hassles of running out. While the pads do last for one week, certain circumstances may need you to replace them more frequently. Some customers, however, do say they didn’t need to replace the pads even after 2 weeks, so it really all depends on your cat’s activity. While these refill pads are more expensive than other alternatives, their ability to reduce odor and properly absorb urine makes them a must-have for an odor-free and mess-free litter box.